1) Just because policymakers claim that regulation is meant to protect consumers does not mean it actually does so. Innovation-killing: Regulations become a formidable barrier to new innovation, entry, and entrepreneurism. Unintended consequences: Instead of resulting in lower prices & better service, the opposite often happens: Higher prices & lower quality service. (Example: Painting all cabs same color destroying branding & ability to differentiate). 2) The Internet and information technology alleviates the need for top-down regulation & actually does a better job of serving consumers. Ease of entry/innovation in online world means that new entrants can come in to provide better options and solve problems previously thought to be unsolvable in the absence of regulation. Feedback mechanisms (product & service rating / review systems) create powerful reputational incentives for all parties involved in transactions to perform better. Self-regulating markets: The combination of these three factors results in a powerful check on market power or abusive behavior. The result is reasonably well-functioning and self-regulating markets. Bad actors get weeded out. Law should evolve: When circumstances change dramatically, regulation should as well. If traditional rationales for regulation evaporate, or new technology or competition alleviates need for it, then the law should adapt. 4) If we need to “level the (regulatory) playing field,” best way to do so is by “deregulating down” to put everyone on equal footing; not by “regulating up” to achieve parity. Regulatory asymmetry is real: Incumbents are right that they are at disadvantage relative to new sharing economy start-ups. Don’t punish new innovations for it: But solution is not to just roll the old regulatory regime onto the new innovators. Parity through liberalization: Instead, policymakers should “deregulate down” to achieve regulatory parity. Loosen old rules on incumbents as new entrants challenge status quo. “Permissionless innovation” should trump “precautionary principle” regulation: Preemptive, precautionary regulation does not improve consumer welfare. Competition and choice do better. Thus, our default position toward the sharing economy should be “innovation allowed” or permissionless innovation. Alternative remedies exist: Accidents will always happen, of course. But insurance, contracts, product liability, and other legal remedies exist when things go wrong. The difference is that ex post remedies don’t discourage innovation and competition like ex ante regulation does. By trying to head off every hypothetical worst-case scenario, preemptive regulations actually discourage many best-case scenarios from ever coming about. 5) Bottom line = Good intentions only get you so far in this world. Just because a law was put on the books for noble purposes, it does not mean it really accomplished those goals, or still does so today. Markets, competition, and ongoing innovation typically solve problems better than law when we give them a chance to do so. Randolph J. 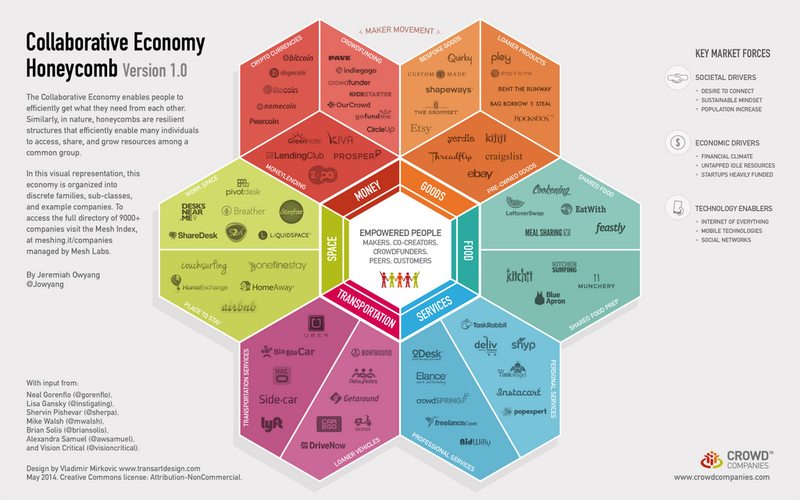 May & Michael J. Horney, “The Sharing Economy: A Positive Shared Vision for the Future,” Free State Foundation, Perspectives from FSF Scholars, Vol. 9, No. 26, July 30, 2014. R.J. Lehmann, “The Sharing Economy Will Thrive Only If Government Doesn’t Strangle It,” Reason, August 2, 2014. 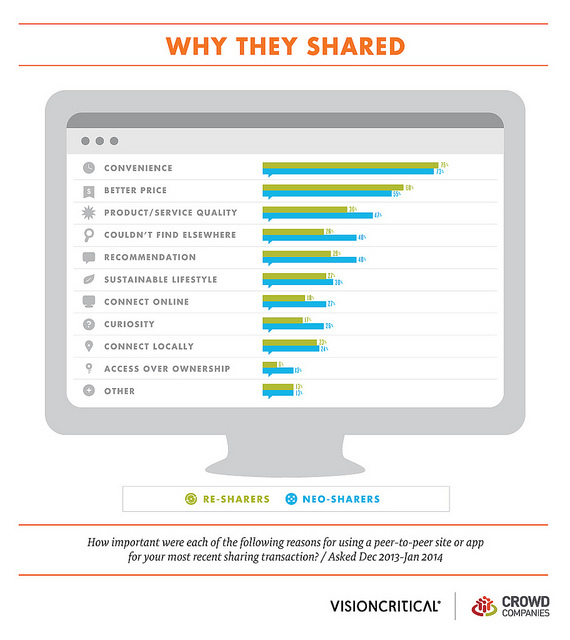 Andrew Moylan and R.J. Lehmann, “Five Principles for Regulating the Sharing Economy,” R Street, Policy Study No. 26, July 2014. Eli Lehrer & Andrew Moylan, “Embracing the Peer-Production Economy,” National Affairs, 2014, p. 51-63. Arun Sundararajan, “Why the Government Doesn’t Need to Regulate the Sharing Economy,” Wired, October 22, 2012. Matthew Mitchell and Michael Farren, “If you Like Uber, You Would’ve Loved the Jitney,” LA Times, July 12, 2014. Daniel M. Rothschild, “How Uber and Airbnb Resurrect ‘Dead Capital,’” The Umlaut, April 9, 2014. Daniel M. Rothschild, “Renters and Rent-Seeking in San Francisco,” Technology Liberation Front, April 15, 2014. [podcast] Michael Munger on the Sharing Economy, EconTalk, July 7, 2014.
video of Michael Munger talk on the Sharing Economy, September 25, 2014. John C. Moorhouse, “Consumer Protection Regulation and Information on the Internet,” in Fred E. Foldvary & Daniel B. Klein (eds), The Half-Life of Policy Rationales: How New Technology Affects Old Policy Issues (Cato Institute, 2003). Rachel Bostman, What’s Mine is Yours: The Rise of Collaborative Consumption (2010).